Calculator has 8 digit LCD display read out.
. It has multi-function keys with full memory functions.
. Auto shut off and raised durable rubber keys.
. Clipboard comes with a built in document storage box to hold documents / paper.
. It comes with a movable bar in the storage space to allow you create compartments.
. Clipboard storage space is ½ inch (17 mm) deep and holds 8 ½ x 11 size forms.
. 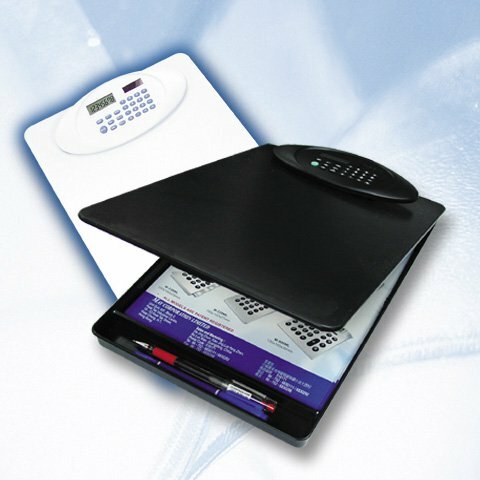 The clip provides over 1 inch document holding capacity.
. Comes with a hole for wall / rack hook up.
. Clipboard comes with edge guard for document alignment.
. Clipboard has a solid writing surface for documents.
. Writing surface dimension is 8 ½ x 12 inches (A4 Paper Size).
. For use in school, office, warehouse, hospital, and anywhere clipboards are used.